Death, The One and the Art of Theatre is the latest collection of Barkers distinctive and revelatory philosophical musings on theatre. It is a stunning array of speculations, deductions, prose poems and poetic aperçus that casts a unique and unflinching light on the nature of tragedy, eroticism, love and theatre. Exploring the juncture between aesthetics and metaphysics, the book looks at the human experience of love and death as life at its most intrinsically theatrical. 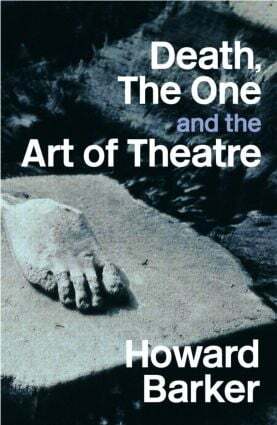 Howard Barker is an internationally renowned playwright whose works are regularly produced throughout Europe and the US. He is widely known for his controversial explorations into contemporary tragedy and his anti-Brechtian focus on the irrational and the catastrophic. He is often credited as a major influence on the generation of playwrights that includes Sarah Kane. Death, The One and the Art of the Theatre is a profoundly unsettling and inspiring piece of writing and extends the challenge to orthodox morality that Barker first presented in Arguments for a Theatre, a challenge he describes as men and womens secret longing for the incomprehensible nature of pain. Howard Barker is an internationally renowned playwright whose works are regularly produced throughout Europe and the US. He is widely known for his controversial and satirical explorations into contemporary tragedy, and his anti-Brechtian focus on the irrational and the catastrophic. He is often credited as a major influence on the generation of playwrights which includes Sarah Kane and Mark Ravenhill.